← Want to become a certified Oracle expert free of charge? Schedule your implementation exam during Oracle OpenWorld 2017! 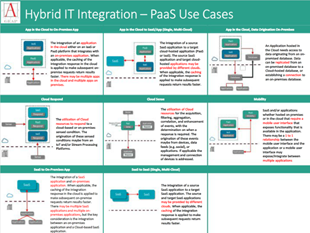 This document provides a Hybrid IT Integration Use Case poster that provides a conceptual view of some common hybrid IT integration use cases. The hybrid IT integration use cases illustrated, coupled with the various deployment options (cloud, on-premises, hybrid, centralized, federated) can be used to narrow down the number of hybrid IT integration patterns that might be applicable to a particular integration requirement. Get the poster here.